Haven’t booked your holiday for this year yet? Then treat yourself with a wonderful private safari in Tanzania! 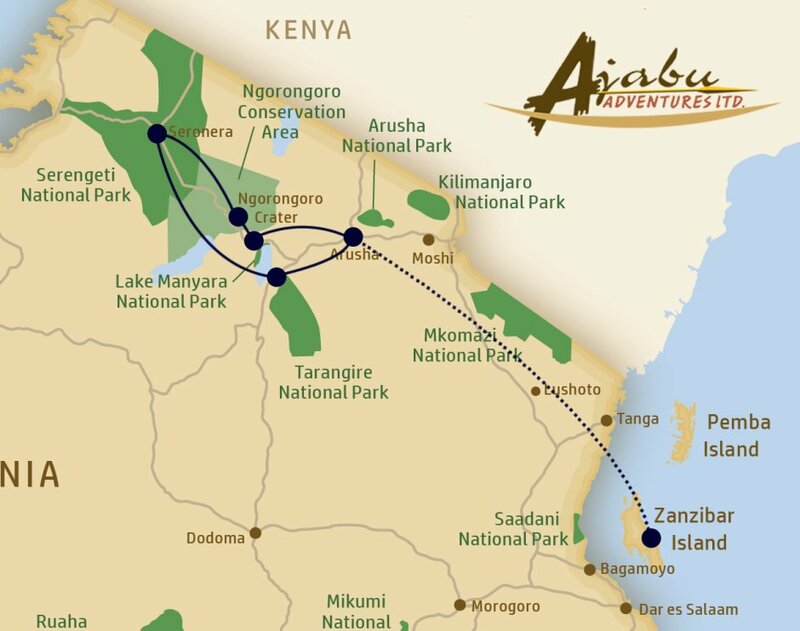 This 8-days tour will take you from the beauty of Lake Manyara to the vast wilderness of the Serengeti. And from the awe-inspiring Ngorongoro Crater to the abundant Tarangire National Park. And why not truly unwind with some extra days at the tropical beaches of Zanzibar? For this special safari we have selected some unique and luxury lodges. Travel in November 2017 and receive a discount up to almost USD $700 per person! Karibu sana Tanzania! Your private guide will welcome at Kilimanjaro International Airport and bring you to your accommodation in Arusha for an overnight stay at Rivertrees Country Inn. You leave Arusha for your first game drive in Lake Manyara National Park. Enjoy a full day in this beautiful and relatively small park, which is famous for the large numbers of flamingos and the tree climbing lions. At the end of the afternoon you will start your last drive of today to Karatu for overnight at Rhotia Valley Lodge. Today you will descend 610 meters into the Ngorongoro Crater for an impressive game drive. The crater is also known as the ‘Eighth Wonder of the World’ and is absolutely unique. One of the highlights is the rare black Rhino which you are able to spot with some luck. In the course of the afternoon you will leave the crater and head to Ang’ata Ngorongoro Camp, which is located right on the crater rim and offers spectacular views. Your next adventure will take place in Serengeti National Park; the ultimate “Out of Africa” experience. Immerse you in the splendours of the Serengeti today with a full day game viewing in the park. Explore the incredible concentration of wildlife such as lions, leopards, cheetahs, hippos, giraffes and elephants. During November the great migration is moving from the far north to southern Serengeti, making the central area a perfect place to witness large herds of wildebeest and zebras. You will stay two nights at Kubu Kubu Tented Camp with luxurious safari tents and a swimming pool to cool down after a busy day. You will stay here on all inclusive basis. Today you can enjoy another great safari through Serengeti National Park. Slowly you drive back to the south, passing the Ngorongoro Crater once more, and continue to Karatu. At the end of the afternoon you will arrive at Kitela Lodge, a spectacular refuge in the middle of the mountains. You will stay here on all inclusive basis. After breakfast your guide drives in the direction of Tarangire. En route you may decide to make a brief visit to an authentic Maasai village, visited by Ajabu Adventures guests only. In the late morning you will start exploring Tarangire National Park with a picnic lunch in the park. Sport large herds of elephants near the Tarangire River, while migratory wildebeest, buffaloes, zebras and impalas crowd the shrinking lagoons. At the end of the day drive to Maramboi Tented Camp for overnight. Regretfully your safari comes to an end. Have a calm morning and possibly make a walk to the lake, escorted by a Maasai warrior. Depending on your further travel plans your guide will bring you to the airport where you say goodbye. Tip: Extend your safari adventure with some relaxing moments at the soft, white sandy beaches of Zanzibar! Unwind at the small paradise of Michamvi Sunset Bay Resort, taste the fresh coconuts and enjoy the beautiful ocean during a romantic sunset cruise. The beach extension can be booked at only USD $895 per person extra. Included is a domestic flight Arusha – Zanzibar and Zanzibar – Dar es Salaam, airport transfer, 5 nights at Michamvi Sunset Bay Resort in a double room based on half board and a FREE sunset cruise! Interested? Leave your details below and we would be delighted to send you a detailed safari offer!